Why Civilians are Not Computers – Constable BV. 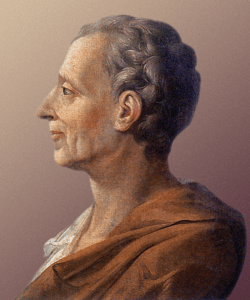 Montesquieu tried to balance the Power of the State. He defined three functions called the Executive, the Legislature and the Judiciary. He based this model on the British constitutional system, in which he perceived a separation of powers among the Monarch, Parliament, and the Courts of Law. In a Democracy the Parliament represents the People. It is chosen by an Election. Out of the Parliament the Executive Power is chosen by a Majority of the Votes. At this moment the Executive Power is not one Person, the King. The real executive power is the Bureacracy. Since the times of Montesquieu the Real Government has grown out of proportion. It is practising a very special approach called Muddling Through. When you work yourself through the Mudd of Politics you move along with the Centers of Power that are now Moving all the Time. Muddling Through is an approach that is wasting a lot of time, energy and money and the practical result is most of the time not visible. The model of the Trias Politica was mainly created to protect the Legal System. At that time is was “without power” and was highly needed to keep the total System in Balance. At this moment the Legal System is too Powerful and Highly Inefficient. We have to create a new balance. At the Time of Montesquieu the People were without Power. The Parliament was a representation of the Elite. This Elite controlled the People. At this moment a new Elite is controlling parliament but it is not representating the People. The people are Individualists that want to go their own way. Every new law is frustrating their efforts to accomplisch something with other Individualists. The Old Democratic System is dying but the System is unable to define a new System that is more suited to the current Spirit of Time. The Old System is also unable to use Network Technology to Unite the Individualists into Groups that work for the benifit of the Whole. The Cybernetic Cooperation could be the answer. Second and Third Order Cybernetics contains all the answers to solve the Problems but the people in the Political Mud are very busy to keep their Positions and don’t spend much time to look at the facts. To keep the System in Balance Laws are formulated based on a Law of General Principles, The Foundation Law (GrondWet in Dutch). Every new Law has to obey this Law. The Trias Politica was formulated around 1700 in the Era of Enlightenment. After 300 years it is still implemented in Government. Since the Enlightment the Science of Defining and Maintaining Laws has transformed itself in First and Second Order Cybernetics. Everybody knows Democracy is not functioning any more. It looks like nobody is able to agree that it is based on a Theory that is proved to be Wrong. When People try to discuss Democracy they are almost all the time attacked mostly by the People that are Part of the System. They believe there is no alternative to the current System. Although it is impossible to manage a Country with a Software System it would help them to understand what is wrong with the Law. If they would have developed a Software System to manage the Country they would have found out that they needed something else. It could be possible that they would have made the move from First Order Cybernetics to Second Order Cybernetics (or Higher). When I Tell you to do Something and You don’t understand what I am telling You, You are unable to do what I told You. If I tell You to do something and You understand what I am telling You but You don’t want to do it or you are not able to do it you don’t do what I told You. The Government is Executing a Computer Program without Using a Computer. The Laws are just Words and they are not Logical. So if the Government would implement its Laws in a Computer the Computer Would Stop Immediately. Is it possible to formulate Rules that Control the State that can be executed by a Computer?